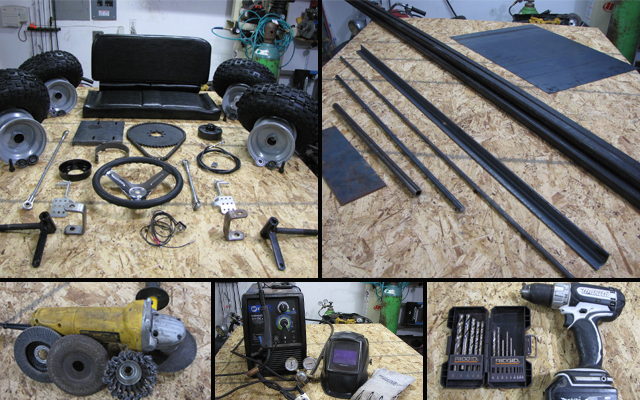 Here is a list of all the tools, parts, and materials needed to build a go kart. 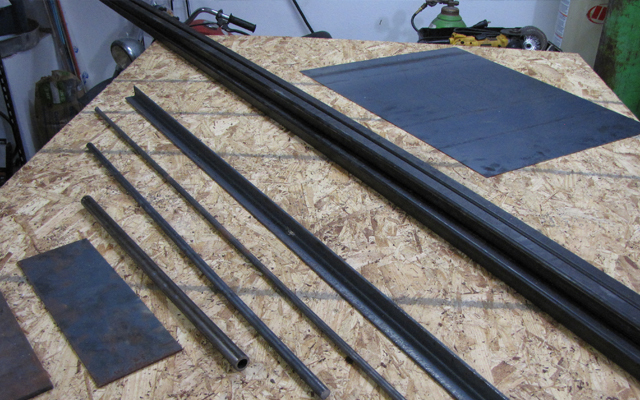 A welder is a must have for building a go kart frame. To weld properly, you will need a little practice on some scrap metal. Learning how to weld is like learning how to draw. It takes a little practice, but once you have it down, you can make something amazing! 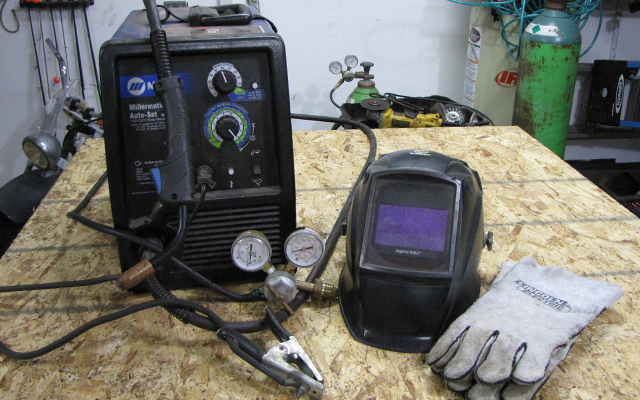 The two basic welders that are most commonly used are wire feed, and stick. The wire feed welder (above) is a MIG welder that uses 75%Ar/25%CO2 mix. Inexpensive wire feed welders, such as these welders on amazon will also do the job and don’t require a shielding gas. Stick welders are a little harder to weld with, but are also inexpensive. 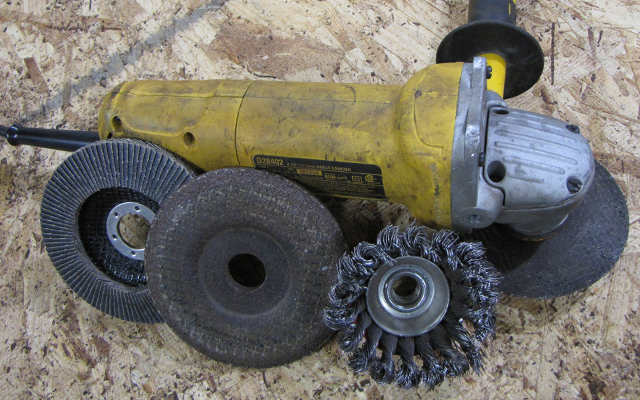 An angle grinder is by far the best tool to have as it can do so many things. I used this almost exclusively for all of my tubing cuts with a metal cut off wheel (pictured on grinder), and all of my plate cuts were done with the cut off wheel as well. You can get an angle grinder on amazon here. The wire wheel is used to remove surface rust and burrs. The grinding disc is used to grind down some welds, and bevel edges. The sanding wheel is used to polish up and round the steel. A drill was used to drill holes for the pedals, steering wheel, throttle cable, brake rod, seat, steering shaft, Pitman arm, and mounting brackets for the seat. 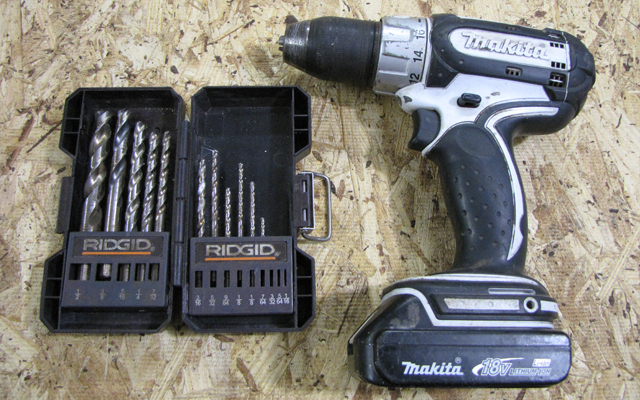 You can get a 1/2″ cordless drill from amazon as well. Measuring Tools were used to level and position the frame, and mark angles to be cut. 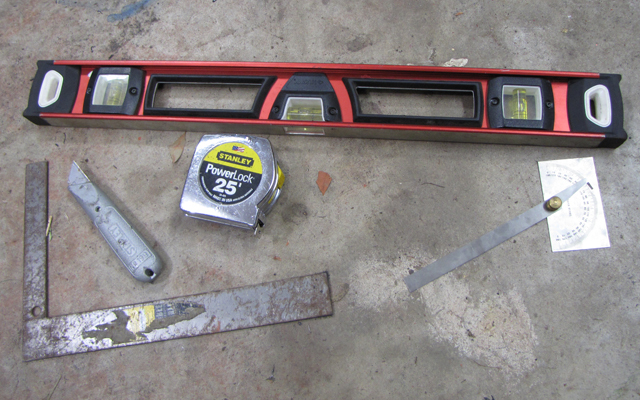 The level was used to make sure the frame was level, the square was used to keep the frame square, tape measure for checking distances, protractor for angles other than 90 degrees, and the razor blade was used to mark the steel for visibility when cutting. I got my go kart parts kit to build the kart in a package from a reputable go kart parts store. They were kind enough to work with me and make a kit available on their website when they found out I was going to make free plans available and a step by step guide (what go kart parts supplier wouldn’t right? – I contacted others, but they didn’t respond so there ya have it). I already got a lot of my parts from them anyway, and I made sure that they would make the parts much less expensive than if somebody were to go out and buy them separately. 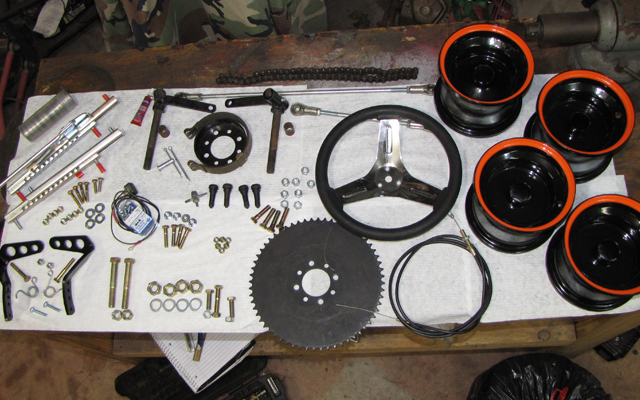 The below parts are what I ended up figuring out I needed for the kart with all the hardware too (the rims come grey). Its your choice to get whatever parts you want because the plans list them out individually, but the kit is there and all of the parts will work perfectly with the build! Tires, rims, seat, motor mount, drive wheel, clutch, sprocket, chain, throttle cable, bearings, tie rods, spindles, spindle brackets, steering wheel, kill switch, seat slider, return springs, and heavy duty gas and brake pedals – all of which would be a royal pain to get separately – you can thank me later by sending me a picture of your finished kart, or thumbing up all of my cheesy videos on youtube. 1″x1″x1/8″ angle iron, a 1″ section was used as a steering stop. 1/4″ round bar, a 60″ section was used for the brake rod. Nuts, bolts, washers, spacers, cotter pins, and a clevis pin are all hardware that will be needed to assemble the parts kit to the go kart frame you will be building. You can take the build plans to your local hardware store and spend about $20-$30 USD for all hardware in one stop. I got mine at a local farm implement store. The exact hardware with lengths, quantities, and locations of assembly are in the go kart plans, but here is a quick rundown of the hardware. 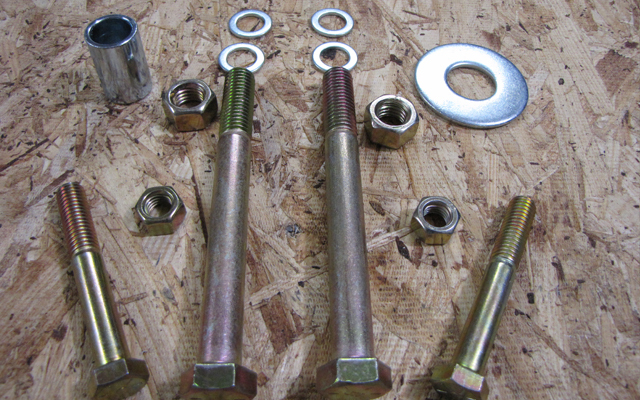 5/16″ nuts and bolts are used for engine mounting, pedals, seat slider, and drive wheel assembly. 1/4″ nuts and bolts are used for mounting the brakes and throttle linkages to the kart pedals, kill switch, steering wheel, and seat to seat frame. A clevis pin and cotter pins are used to mount the brake band to the frame and brake rod. Well, now that you have all of your materials out of the way, let’s get down to cutting up your newly acquired steel with that angle grinder. Hey KarFab, I’m in my last year of school and my friend and I plan to try and make a semi budget go kart with a decently powered motor, most likely a shifter with foot clutch. Id just like to ask you, if you could estimate, what would you say something like that would cost to build? no idea, good luck with your build. I’m a high school student who’s running a project to build a go-kart but my school requires a 3D model of it. I have Solidworks on my laptop and was wondering which design you would recommend making to make the Kart cheaper but reliable. If possible do you have the plans stored as a CAD file that I could download to show your original plans without me needing to replicate them? Thanks! Your school requires a 3D model of it and you just want to copy mine? Sounds like you need to put in some work on your own to earn the grades instead of plagiarizing someone else’s work. I give out my plans freely for the one hweel drive go kart, but they are in fact copywrited. Good luck with your project, and I know you will do well if you just put in the effort to do it yourself. i dream about having a go kart personally made by me like you. i admire those people who can afford, have it and make it and off course enjoying making it. but as for me it just a dream hahahha 😀 😀 its too expensive for me for poor people like me. my nephew was too poor to do anything, then he got a job and gets paid minimum wage and is able to afford things he once thought he never could. To make your dreams a reality, think about what you could do to earn money, then make a plan on how you are going to do that, and then DO IT!!! You will be proud of yourself once you actually do what it takes to accomplish your dreams. We have all been there, including myself. If i use the kit a I able to use a different frame? You will be able to use whatever plans you have as long as you pay attention to the parts and how everything goes together. Hello. I am 15 and wanting parts for christmas. I cannot weld, and am not allowed to learn to weld. Is there any way that I can build a kart with a 212cc 6.5 predator, without welding? i only have simple tools like ratchets and sockets and stuff like that. The pictures of the parts cut out look like a CAD drawing. Can I download a DXF or SVG, or CAD of the cutout so I can get them cut on a CNC plasma? You can whip some up if you have a CAD program using the measurements. Unfortunately these are PDF. Great work, is the a kit I can buy what already has all the nuts butts and misc materials? You can take the list to a real hardware store and get the hardware. Places like tractor supply, ace hardware, and Lowe’s are a good place. I’m planning a plywood body around a kart for the kids…I’m having trouble around the drive wheel since the sprocket and brake drum are mounted just inside the tire. I’d like those parts to be hidden by the body. I see the live axle has a more centered sprocket which would make this easier for me. Is there a way to mount the fixed axle sprocket and brake drum more towards the center of the body to hide it better? yeah, you just weld the bolt for the fixed axle wherever you want it to go. Or, you could brace up a “live axle” version that acts as a 1 wheel drive, using the same diameter rod as the fixed axle bolt. I need a 5/8 60 tooth sprocket #35. Do you know where I could get one? Hey I have a 200cc 4-stroke motor. How fast do you think it would go? A local steel supplier, steel yard, or sometimes metal recycle place. I have a quick question? I’m intrested in building a go kart and using your plans, but the only thing is i dont know how much to cut each steel? What is the best material for pedal to use In go kart ? You are talking about hydraulic brakes. Search on google how to assemble hydraulic brakes for ideas. Google not shows any desirable process please suugest you. How much would it all in all cost to build the go kart? Yes, but I will not show how to, just tell you. First you buy a comet FNR gearbox, and you attach the driven unit of a comet 30 series torque converter to it and you can then reverse after fabricating a bracket and attaching a lever for FNR. Hey, I am trying to plan the go kart I’m about to build, but I’d like some imput, I was wondering what axle kit is best for me, I was thinking of using a drift trike axle kit would be fine since it is the rear, my neighbor used one for his drift trike so I have seen and worked on them once or twice. I like and extremely prefer the axle kits that drive both rear wheels. If I want to upgrade to (only) torque converter from the standard live axle plans, the directions state to follow the deluxe plans for the frame. Would the rear 6″ tires will make the cart lower in the rear? Maybe I’m missing something? Yes you are missing something. Deluxe plans have the axle higher up and a different frame. No big deal though, you can opt for standard live axle plans and the smaller tires. The go kart will accelerate pretty quickly, but top out at maybe 30 mph iirc. That was my original intent (standard live axle plans) and upgrade from c-clutch to TC. The instructions seemed to point to needing the deluxe frame if TC was used. Do I need the deluxe frame to fit the TC? Kian, you will need to click on the link to the kit, then fill out your shipping information to estimate shipping. I do not sell the kit, just link to it. I recently acquired an old rusty Bird Engineering go kart frame from a buddy at work. My sons,7&5 helped me strip the frame,prime it and paint it. We used a 212 predator,12t hilliard extreme duty clutch,60t rear sprocket,6 inch rims and tires,etc. every part new. We learned how to weld,grind,etc. Its been a lot of fun. Just wanted to say thanks as this site and your videos helped us tremedously! Thanks again. Thanks for the kind words. Glad you had fun restoring it! It’s nice to see that someone was considerate enough to thank you without wanting you to do all the work. Trouble with kids these days, they’re too lazy to do their own work with the research etc.. , and never grateful enough for the advice to at least thank you. I’m just putting that out there. Maybe it will do good for at least 1 or 2 of them then I feel it helped out someone. I am glad to see someone is willing to share a great idea. My question is I have a old suzuki 4 wheeler with no clutch and a shaft drive will your frame design handle the torque load that engine produces? You didn’t give me enough information to answer your question, so it seems that you haven’t really thought this through. Did you have any trouble in building the kart also, do you anyone or has anyone contacted you to tell you that they tried and succeeded in building the kart? Yeah lots of people have, just check my facebook and you will see. yeah, but be safe. If you have never worked with steel before, learn how to weld first. yeah, 100cc is the lowest id go on a kart like that, only with small kids. Those smaller engines also use a 5/8″ shaft instead of a 3/4″ shaft iirc. Can you mount an electric motor on the cart? Would you recommend it? Possible but I have not given it much thought. I have a Briggs & Stratton engine from a power washer want to convert it from a vertical motion to horizontal motion to make a go kart do you have any plan on how to change it ?? Yes. What you do is you take that engine and you sell it, then you buy a horizontal shaft engine. Lucas, just go to the link here http://www.gopowersports.com/go-kart-kit-without-engine/#_a_KartFab and scroll down to the table of parts, it has all the exact parts I used in the build. So steering, brake band, throttle pedals, cable, and seat. Brakes are for the 5/8″ stud dead axle kart i have in my free plans, but if you wanted to do live axle, you could do that as well, but it would require different brakes. Do you sell karts already built? Not yet. I only sell plans, and give out free plans. I want to use a higher power engine like a 420 cc, the mount might have to be changed slightly, but will everything in the kit be compatible? If you could give me a better engine or one that would work with this set other than the 212 cc engine. Zimraan, unfortunately you are on your own as it is not safe to do that, plus the clutch wont fit. the one which is lighter n good in strength and is not too costly…. Yeah, it’s in the plans (11 ga 1″ tubing) or you can get 14 ga tubing but that is as thin as you should go. The front and rear axles should be 11 ga though. What is the curb weight of the cart? I do not know. I would say less than 100 lbs. Excelent work, thanks for share. I´m gonna tray it! Forgive my english, i´m Argentinian. Cool! Let me know how it goes. I’m in the initial stages of planning. One major flaw is that motorized drift trikes have their center of gravity too far back. Yeah but you will need to make sure it is thick enough (how thick I don’t know). You will also need to weld tabs to the kart to bolt the aluminum to the kart (I’m assuming you already knew this but this is for those that may think you can weld aluminum to steel). I didn’t know that! Ha-Ha I’m so new to this whole thing, I don’t know what I don’t know! But that said, I have watched these videos over and over and I’m learning more all the time. I’m quite concerned about my ability to make straight tubing cuts with the angle grinder. Any tips? Unfortunately, no. I will be uploading off road go kart plans in the future after I build a prototype and make sure its worth downloading. What’s better, #35 chain or #420. Is using #35 chain for these plans alright? I see that #35 chain is cheaper than #420 chain. 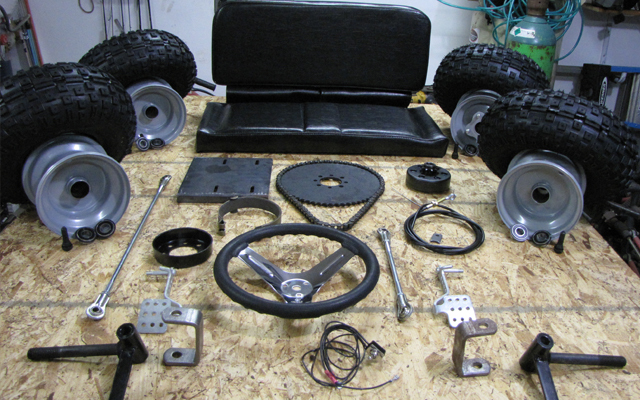 The go kart kit that you need to get has everything you need in it for the plans. The kit uses a stronger chain. Its not just strength, but chain size. If you were to get the 60t sprocket, the #35 chain would not work as it is too small of a pitch. Great information here. Question…Do you have a plan that would enable you to install a roll bar? nope. But there is a slot in the seat so you could add a roll cage and seat-belts to the kart if you wanted to with your own ingenuity. This go kart is like an old school go kart, not a buggy. mild steel is fine, 1″ square tubing, 11 ga.
Hey man can u help me regarding steering system material for gocart,,which materials are suitable for steering system ? Thanks. It’s good to hear! That’s me as well. I stumbled on to Kartfab.com and have been totally inspired. Going to look for steel material right now!